KOHAR showcased its largest concert with Stars of Armenia at Liberty Square near the Opera House in the heart of Yerevan on 28 May 2011. The star-studded event brought together the most popular singers of Armenia who performed with KOHAR their much-loved songs that are admired by fans and audiences alike. The live concert was broadcast live by Armenia’s Channel 1 TV and for the first time via Internet live stream. Over 10,000 spectators, in addition to tens of thousands of TV and Internet viewers from Armenia and the Diaspora, were mesmerized by KOHAR’s performance of the finest tunes and the program which was dubbed as the biggest show ever performed in Armenia for its grandiose magnificent production. KOHAR’s latest production by HAYASA (Cyprus) and Domino (Armenia) boasted a superb 3D mapping and projection on the façade of the Opera House of images that transposed into Armenia’s unyielding history from Noah’s Ark to its national symbol Ararad, its rich Alphabet – the Ayp Pen Kim – reaching historic Armenian Kingdom of Cilicia. KOHAR’s over 150 orchestra and choir members as well as the 15-member dance ensemble performed in the presence of both Presidents of the Republic of Armenia and Nagorno Karabakh Republic. The guest list included the high echelon of Armenia’s political spectrum, including the Prime Minister & the Speaker of the National Assembly, church representatives headed by Catholicos Karekin II, and many celebrities and artists. Needless to say, Cyprus-born conductor, Maestro Sebouh Abcarian, engraved the Armenian culture with yet another golden page titled KOHAR. His enchanting baton movements brought onto stage the A-list of Armenia’s entertainment scene: Hayko, Arsen Safaryan, Shushan Petrosyan, Leyla Saribekyan, André, Aramé, Zaruhi Papaian, Nune Yessayan, Inga & Anush Arshakyans, Roland Gasparyan, and Tata Simonyan. The culmination of the night was the performance of the song “Babenagan Guiliguia,” which has topped the charts in Armenia as the Number 1 song for the past 8 consecutive weeks. Together with KOHAR, the audience joined in the performance waving more than 3000 flags of Kingdom of Cilicia that were distributed by the organizers. A similar enthusiasm from the audience erupted with the song “Veraganknir Guiliguia,” which has become KOHAR’s anthem. 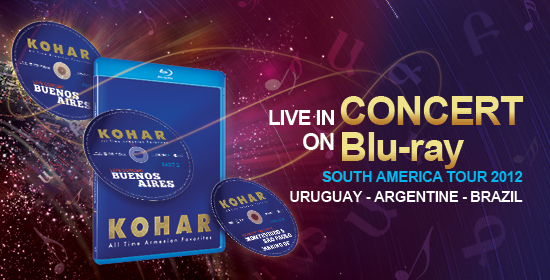 KOHAR is the brainchild of the patron of Armenian culture, Mr. Harout Khatchadourian of Lebanon, who sustains all the activities and concerts of KOHAR, in memory of his late father Mr. Aram Khatchadourian, and as a tribute to his mother Mrs. Kohar Khatchadourian.